No, T3 isn't turning into a robot-obsessed love fest but we do love seeing innovations in the field of robotics. 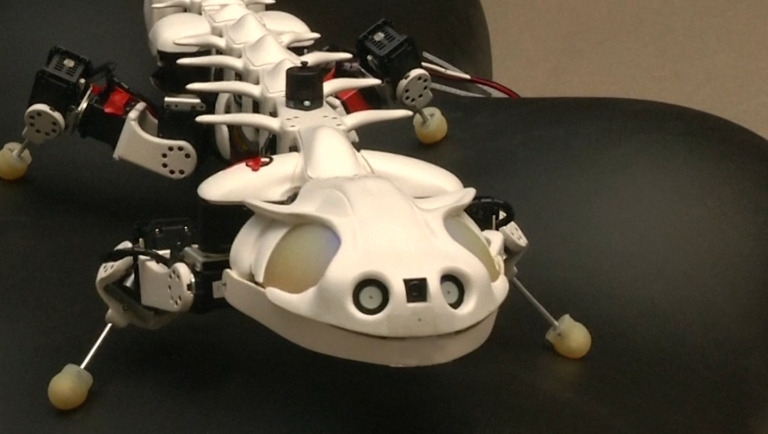 Take the latest creation to come out of the Swiss Federal Institute of Technology in Lausanne (EPFL), the reptillian Pleurobot. Designed to move and swim just like a real-life salamander. Using X-rays and footage of salamanders in motion, the team at the EPFL have been able to recreate a robotic exoskeleton that mimics both the physical mannerisms and the speed of movement of the living creature it's emulating. Robo salamanders aren't anything new - the EPFL itself presented an early version of the Pleurobot as far back as 2007 which used a new artificial type of spinal cord - but they've become a fascinating challenge for the robotics community as teams attempt to recreate the movement of such a unique animal. That spinal research has enabled the EPFL to create a spine that doesn't contain as many vertebrae as a real lizard, but with enough components to allow for a smooth and dextrous motion. The Pleurobot was designed using 3D printed parts, motorised joints and servos as well as a series of circuits designed to work much like an artifical central nervous system. The Pleurobot, which is fully waterproof and can be submerged without losing power or shorting out, is enabling scientists and engineers to use this nervous system to see the kind of stress a spine endures while walking or swimming. The team is hoping the research could help them understand just how strong and versatile an artificial spine would need to be to support a much larger or faster robot.